“With the market now overbought on a WEEKLY basis, there is little “fuel in the tank” effectively to substantially drive prices higher in the short-term. Therefore, with risk outweighing reward at the moment, a more cautious stance to portfolio management should be considered. On Monday, the market did indeed break above 2100 as suggested. That rally higher was driven by Yellen’s comments that suggested no rate hike coming in the months ahead. However, while her comments were certainly dovish, the markets had already been pricing in a “no rate” hike scenario during the last couple of weeks as the economic data continued to crumble. This was most clearly seen in the collapse of the dollar on Friday as the extremely weak employment data killed rate expectations reversing recent currency flows in expectations of higher yields. In April, I discussed increasing equity exposure as the markets pushed higher. “With the breakout of the market yesterday, and given that “short-term buy signals” are in place I began adding exposure back into portfolios. This is probably the most difficult “buy” I can ever remember making. However, now, as we move back into a “seemingly” more bullish set-up, I can begin to increase equity allocations modestly. Notice, I said modestly. I didn’t say go buy every high-beta thing you can get your hands on. As I stated, buying this breakout goes against virtually everything in my bones as the fundamental underpinnings certainly don’t support taking on equity risk here. We are moving into the seasonally weak time of year. Longer-term technical underpinnings remain bearish. It is the summer of a Presidential election year which tends to be weak. 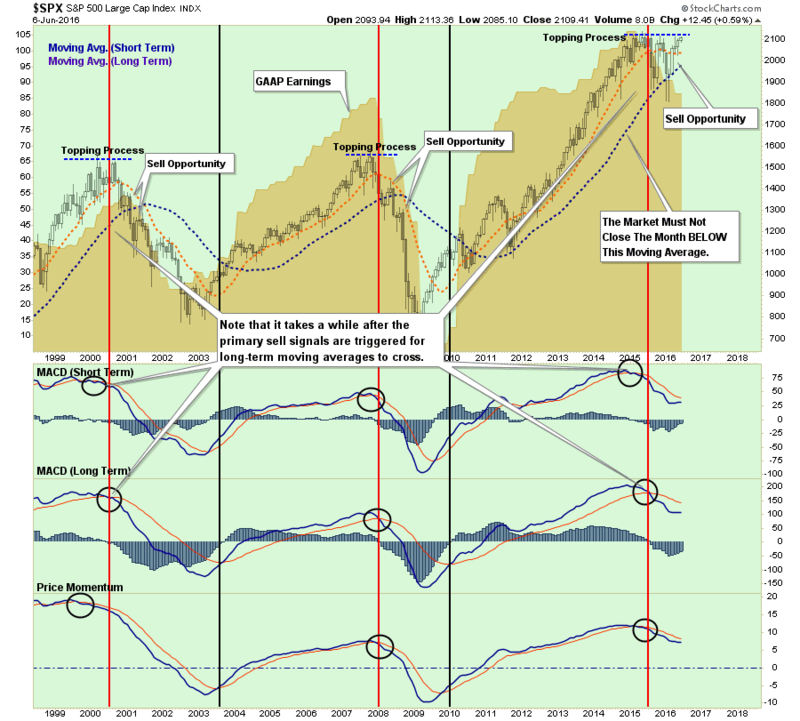 The chart below is a monthly, long-term, chart of the market. Currently, every major sell-signal, with the exception of the monthly moving-average crossover, is in place. Such would suggest that a more ‘bearish market’ remains in place, especially given the deterioration in earnings. “While I am increasing exposure here, I do suspect that price volatility has not been eliminated entirely which is why I remain cautious. Hope the economy will improve in the second half of the year. Hope that earnings will improve in the second half of the year. Hope that oil prices will trade higher even as supply remains elevated. Hope the Fed will not raise interest rates this year. Hope that interest rates remain low. If anything has changed since April, it is only that the fundamental and economic backdrop has gotten weaker. However, it is that weaker backdrop that is driving asset prices higher as further monetary policy tightening continues to be pushed further out on the timeline towards “never.” As I wrote in December of last year, the likelihood of a “one and done” Fed is becoming a reality. “A third reason relates to the risks associated with the constraint on conventional monetary policy when the federal funds rate is near zero. If inflation were to move persistently above 2 percent or the economy were to become notably overheated, the Committee could readily increase the target range for the federal funds rate. In simple terms, the Fed understands that regardless of the economic risks associated with tighter monetary policy, the need to normalize rates before the next recession is more important. Being caught at the “zero bound” nullifies one of the useful policy tools at the Fed’s disposal to stem the impact of an economic recession. While Yellen espouses hopes of improving economic activity and a stronger labor market, as I showed you this past weekend, their own Labor Market Conditions Index is already telling them a different story. Would New All-Time Highs Negate The Bear Market? Yes, from a money management discipline, a breakout to all-time highs would indeed be a bullish short-term signal which would require a further increase in equity allocations in portfolios. You can be assured that if such an event happens, I will indeed increase the equity model in the weekly newsletter further. However, that has not happened as of yet, and for now, we still remain range bound between the lows of 1860 and the 2015 highs as shown in the first chart above. But a look at past history also suggests a breakout to all-time highs, while bullish, does not necessarily negate the onset of a bear market. First, it is worth noting that during the secular bear market of the 60-70’s earnings were rising even as the markets crashed. This was, of course, due to factors of sharply spiking inflation and interest rates and back-to-back recessions. However, it should not be dismissed that a bear market CAN HAPPEN even if earnings are improving given exogenous factors that may weigh on market expectations. China, Eurozone, oil, debt, monetary policy, political outcomes, etc. are all currently in play at the moment which could potentially outweigh any near-term improvement in earnings/profits. As the markets decline, there is a slow realization that “this decline” is something more than a “buy the dip”opportunity. As losses mount, the anxiety of loss begins to mount until individuals seek to “avert further loss” by selling. Yes, if the markets are able to hold the breakout above 2100 this week, it is very likely the markets will make an attempt at all-time highs. As stated, a breakout to new highs will require our investment discipline to make a further increase in equity exposure. Begrudgingly so, but an increase nonetheless. But let me be very clear. Any additional increase in exposure will be done with extremely tight stops and with a portfolio hedging strategy remaining in place. Our investment discipline is extremely strict and requires substantial evidence of trend strength before we “relax” portfolio constraints. More importantly, despite studies that show that “buy and hold,” and “passive indexing” strategies, do indeed work over very long periods of time; the reality is that few will ever survive the downturns in order to see the benefits. “How can you just leave me standing? Alone in a world so cold?